3-10 days to arrive fulfilled by HAORUI'S HOME after shipment. 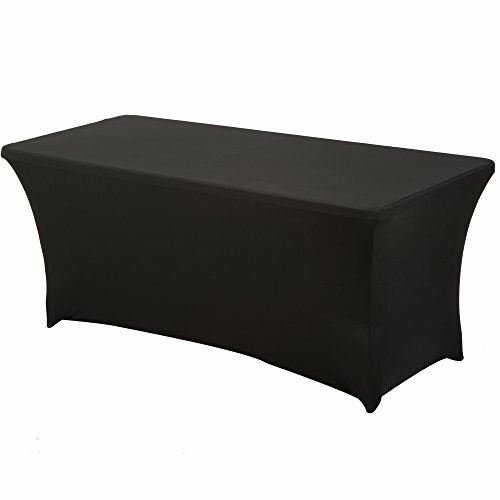 Spandex table cover. GSM. 200 (A measure of the weight and thickness of the fabric).The weight of the item is 1.8 lbs.It is a thick fabric, very durable.It will not be so thin as to see the legs of the table inside. Size:72"L x 30" W x 30" H,Polyester Blend.100% Four-way stretch spandex material. How to Care: Easy Care,Spandex Oblong rectangular stretch table covers are wrinkle free, Washable or Machine wash warm and tumble dry at low temperature. Remove items from the dryer as soon as the tumbling cycle is completed. Ironing not required. Uses:Spandex stretch table cover cloth use for Christmas,Easter,Halloween,Hannukkah,Thanksgiving, Wedding, parties, celebrations or any special event.Our table cloth can be used on the dessert table、display table、buffet table、DJ table etc.It works better than traditional tablecloths,When used outdoors,this tablecloth won't slip around or billow with wind, it is not easy to stick small crumbs. 3-10 days to arrive fulfilled by HAORUI'S HOME after shipment. Double Oxford cloth made of pockets for legs,it can be used for many times. If you have any questions about this product by Haorui, contact us by completing and submitting the form below. If you are looking for a specif part number, please include it with your message.